Tomorrow is the 37th Annual Twin Sizzler bike race and a longtime veteran of the event is Don Barnett, the service manager of our Medina store. Don enjoys riding the 27-mile loop of the course all year long, and he shares this ride with us in this month's Where We Ride feature. 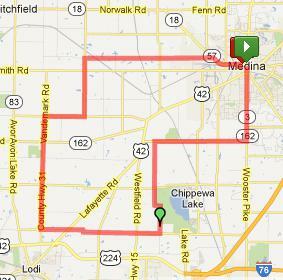 Enjoyable for racers and casual riders alike, the ride starts in downtown Medina and follows scenic back roads around the city. Click here for more details about this route, including an online map, elevation chart, Don's tips for racing and more -- and good luck if you're competing in the Twin Sizzler tomorrow!